Congratulations to the winners of Round 32 cTrader weekly demo contest! 1st place with the award of $150 goes to Mr. Alienforce16 from Kenya. 2nd place with the award of $100 goes to Mr. Dia Romdiana, S. Kep. Ners from Indonesia. 3rd place with the award of $75 goes to Mr. Amrizal from Indonesia. 4th place with the award of $50 goes to Mr. Olexandr Korobkin from Ukraine. 5th place with the award of $25 goes to Mr. Rudi Harianto from Indonesia. 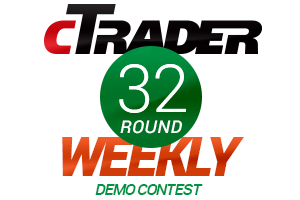 We want to thank all the participants of the Round 32 of cTrader weekly demo contest. If you haven’t won any prize yet, you’ll definitely have a chance to do it in the next round! Register now and test your skills in the upcoming Round 33 that will start in a few days! Discover the advantages of OctaFX and trade to win! сTrader weekly contest – brought to you by OctaFX! Round 15 Supercharged real contest winner: focus on trading!